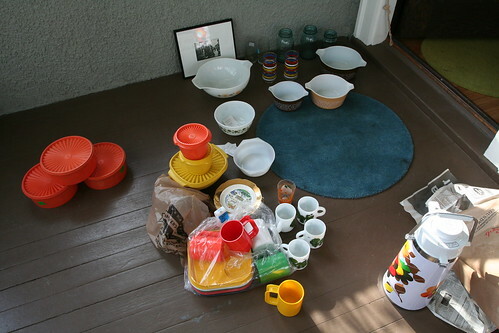 Vintage Tupperware and Pyrex – oh my! Posted at 9:49 am in Uncategorized. My family still uses the avocado green version of that tupperware to store our sugars. It’s nice to see the orange variety. Dane and I will be back in MN in mid-May. We would love to see both of you! That is so cool Kate! We should definitely hang out when you are in town! My parents have the orange set of containers! I have the colorful mugs hehe. I just showed my mom your blog and she said she has the orange tupperware you bought at home…pretty cool!